I kicked off the celebrations for Valentine’s Day last week with a little girl’s brunch ideas! Now that I’ve got the party planners out there thinking, remember the formula for a perfect brunch? Your own mixture of fruit + sweet treats + a cocktail, as discussed in the first part of this series. We knew rosé was the perfect choice when it came to wine, but what to mix it with? After a lot of deliberation we went with POM juice to add a fruity touch and club soda for some bubbles. 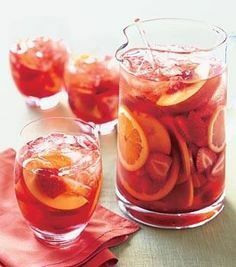 Garnish with some fruit and you’re ready to sip and enjoy! To add a little touch of the celebration, we added these stamped tags. I found them in the dollar section of Target, but you could totally DIY your own with some canvas fabric and these stamps! Loving the idea of a Galentine’s day brunch. So cute! I am literally BLOWN away by how cute these drinks are and how good you are at photography staging. I’m having a girls night on Friday, and definitely want to make these. Aw Katie, thank you so much! That means a lot coming from you! Wow! These images are just gorgeous!! I love this idea! A gathering of friends is always a great time. 🙂 Your pictures are lovely too! Love the precious notes! Yes it is! Thank you so much for stopping by! Aw, thank you! Hope you like!